As you get ready for the beginning of the semester, you might also create a virtual classroom by using Canvas. Canvas can be used to share class materials, collect assignments, communicate with students and grade assessments. You may use one or two features, or you may use it extensively based on your specific needs. Here are a few tips to help you get started. If you have not done so already, request a Canvas shell for each of your courses. To do so, go to MyACU, click on the wrench tool for your course to request a course to be created. Check detailed instructions here. 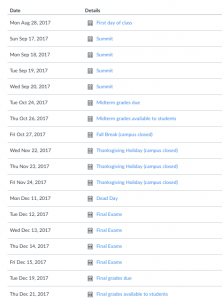 Inform your students, either in class or by email, how they can access their class sites in Canvas. Canvas is linked to Banner through single sign on (SSO), therefore students can also find their courses by clicking on the Canvas icon once they logged in to MyACU. They can also go to their Canvas home page by visiting: acu.edu/canvas. Students will not be able to see your course content until you have published them. You will need to publish your course by clicking on the “publish” button once on the course home page for students to get in. Modules and items will also need to be published for students to access. You will need to click on the cloud button associated with modules and items to publish them. Once published, the item or module will turn green . You can go to student view (click on “settings” on course menu and the student view icon is located towards the far right of the page. You do NOT have to publish every module and every item at the beginning of the semester. Just publish those you want them to see. Add TA to your course. To add a teaching assistant to your course, go to MyACU, find the wrench tool for your course, click on “teaching assistants”, and search for the name of the person you would like to add. It may take up to two hours for the TA to see their course. Some students are new to Canvas and would appreciate some guidance on how to use various functions and features of Canvas. We have shared a series of video tutorials in Canvas Commons for you to import and customize in your course. Check here for instructions. Import a fall template, if needed: Please also note that we have created a template for you to use. This template came with weekly start date and some important academic dates in Canvas (see screenshot below). Please contact Berlin Fang or Amy Boone from the Adams Center if you need help importing it into your course, or if you want other assistance with Canvas. We would also recommend that you bookmark or subscribe to the Adams Center blog as we frequently publish information about Canvas you might find useful. This blog also has a specific section on Canvas you might find useful. This entry was posted in Tips, tools by Berlin Fang. Bookmark the permalink.